'At the end of her life, Catherine, the cast-off wife of Charles Dickens, gave the letters she had received from her husband to their daughter Kate, asking her to donate them to the British Museum, "so the world may know that he loved me once." 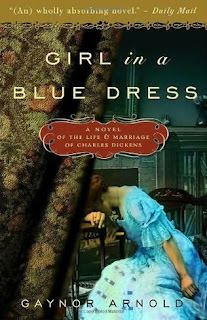 The incredible vulnerability and heartache evident beneath the surface of this remark inspired Gaynor Arnold to write Girl in a Blue Dress, a dazzling debut novel inspired by the life of this tragic yet devoted woman. 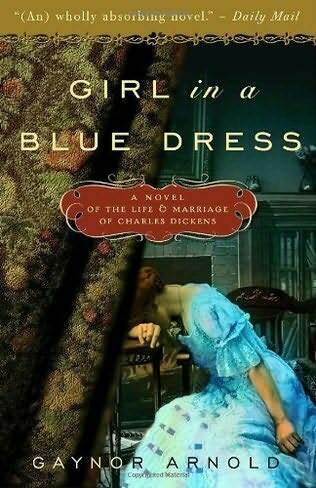 Arnold brings the spirit of Catherine Dickens to life in the form of Dorothea "Dodo" Gibson--a woman who is doomed to live in the shadow of her husband, Alfred, the most celebrated author in the Victorian world. The story opens on the day of Alfred's funeral. Dorothea is not among the throngs in attendance when The One and Only is laid to rest. Her mourning must take place within the walls of her modest apartment, a parting gift from Alfred as he ushered her out of their shared home and his life more than a decade earlier. Even her own children, save her outspoken daughter Kitty, are not there to offer her comfort--they were poisoned against her when Alfred publicly declared her an unfit wife and mother. Though she refuses to don the proper mourning attire, Dodo cannot bring herself to demonize her late husband, something that comes all too easily for Kitty. Instead, she reflects on their time together--their clandestine and passionate courtship, when he was a force of nature and she a willing follower; and the salad days of their marriage, before too many children sapped her vitality and his interest. She uncovers the frighteningly hypnotic power of the celebrity author she married. Now liberated from his hold on her, Dodo finds the courage to face her adult children, the sister who betrayed her, and the charming actress who claimed her husband's love and left her heart aching. Charles Dickens is one of those authors that everyone knows and yet few knew what he was like in real life. He was considered to be one of the best authors out of the Victorian age of literature and his name is synonymous with great writing and famous literature. I have not read any of Dicken's works, other than A Christmas Carol, even though I have wanted to for years. I have a very hard time getting past Dicken's heavy use of words in his writing. It is one of personal life goals to read all of his works one day, however, it is just something that I haven't gotten around to yet. I discovered this book at my local library and wanted to learn more about this fascinating man and who he was as a family man to the people who knew him best. In society, he was considered to be a great moralist, but who was the man behind the pen and novels? Arnold shows the reader what Dickens could have been like and it was a very interesting read. This book flows beautifully and really makes one feel that they are a part of the Dicken's household. The only thing that bothered me about this book was that the characters are named something different. Charles Dickens is Alfred Gibson and Catherine Dickens is Dorothea Gibson. That in itself was a little confusing and I had a hard time understanding exactly why the author chose to use different names for these real life people. The author does state in her forward that the reason she chose different names was because of the historical accuracy, but it was a little confusing at times. I understand that she didn't want to attribute something to the real Dickens in her story and it makes sense, it was just a little different. I really liked learning about Dickens and his family life as I really didn't know much before starting this book. Apparently, Dickens was quite the controlling husband and father. It was nice to see a different side of someone so well-known. I had a hard time putting this book down. I thought that the author did a wonderful job of creating the scene of the background of the story. It was a moving story about love, loss and abandonment. It was also the story of how someone's creativity took up their whole life and effected everyone around them. It was a well researched read that was quite informative and engaging. I am impressed by this author's voice and surprised that this book took me in as well as it did. Overall, a fantastic read that taught me a lot about one of literature's most famous authors. Ive had this book on my shelf forever. Really...forever. I'm glad Ive finally read a review!